Kylar Stern has rejected the assassin's life. The Godking's successful coup has left Kylar's master, Durzo, and his best friend, Logan dead. He is starting over : new city, new friends, new profession. But when he learns that Logan might actually be alive and in hiding, Kylar is faced with an agonizing choice : will he give up the way of shadows forever, and live in peace with his new family, or will he risk everything by taking on the ultimate hit? EXCERPT - "You're the wetboy." The man cursed. He was sweating, his broad face pasty. His bushy black beard quivered as he trembled. "The Shinga said he pissed off some Cenarian wetboy. We were supposed to kill you if you came here." "If I tell you, will you let me live?" Kylar looked into the man's eyes, and curiously didn't feel or imagine - or whatever it had been the other times - the darkness that demanded death. "Yes," he said, though the killing rage was still on him. The man told him of a hideout, another trap, an underground room with only one entrance, and another ten guards. With teeth gritted against the white-cold fury, Kylar said, "Tell them the Night Angel walks. Tell them Justice is come." Only a few first time writers manages to write decent first fantasy novel and then follow it up with a total stunner. This is one such writer. Don't get me wrong, I loved the first book. Maybe not as much as Mistborn, or The Lies of Locke Lamora, nevertheless, the second book in this trilogy is one of my favorite! Azoth is no more. He has fully accepted his life as Kylar and yet, that is not completely true. He is Kylar. But he has hidden away the skills that Kylar possess. Our Night Angel is changing his profession. The best wetboy in the kingdom has decided to hang his boots. Why??? Because he's in love. Yes, epic facepalm moment and yet, feels completely sane. Women does that to men. Even in fantasy world. Now Kylar and Elene run to Caernarvon to start their new lives. But the temptation of meting out justice is too strong to avoid. But when Jarl shows up to his new place and is murdered by Vi, things take a new turn. Now Kylar has picked up this clothes for one last job, to save his childhood friend, Logan. Meanwhile, in Cenaria, when the whores of Mommy K learn that Jarl has been murdered to go on a killing spree that night. Hundreds of the enemy were murdered in cold blood and the revolution to free Cenaria has started. 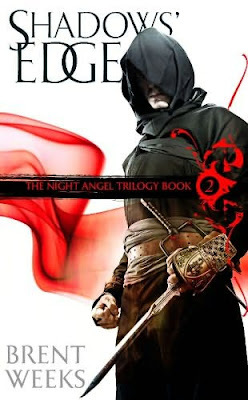 The Night Angel returns to Cenaria and promises retribution. As the rebels rally under Logan, Vi and Kylar team up, despite their enmity to kill the Godking. But killing a God is never easy, as Kylar realizes painfully. And Vi, does the impossible. Something that might save Cenaria but will make her an enemy of Kylar forever. Gritting story. Magic, action packed and naive romance. The second book is much better than the first one. Well, I liked it better. A lot of unanswered questions has been answered as well and we're just beginning to see the strength of Kylar's powers. Great writing by Weeks, the tale looks poised for an epic showdown in the final book. The sudden twist in the end, and that's a whole new different direction the book might proceed it. Its getting better! New characters are introduced in this book. However Vi's was the most interesting by far. She has a big part to play in the final book and hopefully, she's on the good side this time. Not much of a storyline for Elene and Uly, but Kyle and Logan are going to be the most active parts in the final book. no comments till I start the book ( if ever ) :P but yeah , i loved the cover .. i would have picked this book for the cover atleast ! !